Sales performance is on a disconcerting downward trend. That's why sales managers are looking for new strategies to optimize management, effectively support sales teams and get performance back on track. 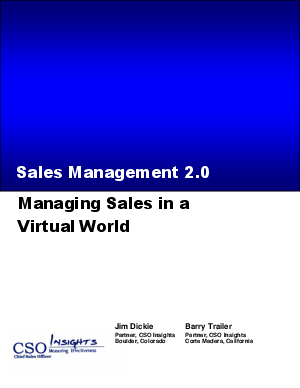 This new CSO Insights white paper, based on the results of the 2010 CSO Insights Sales Management Optimization Study, explores how virtual sales management (VSM) enables sales managers to more effectively help direct reports improve and optimize sales performance.